Yesterday the SNP published "Scotland's Place in Europe". It's a good piece of work and a worthwhile read for anybody who wants to gain an understanding of the (UK wide) issues surrounding Brexit and the various options we face. "24. The EU is Scotland’s second most important international export market. In 2015, Scottish companies’ exports to countries within the EU were estimated at £12.3 billion, which is 43% 16% of Scotland’s total international exports and supports, directly and indirectly, hundreds of thousands of jobs across Scotland." "38. To replace a 5% reduction in Scotland’s EU exports with increased trade from the BRICS economies would require a 30% increase in exports to those economies. Even if the UK signed agreements with the 10 biggest non-EEA single country trading partners (including USA, China, and Canada), a process which would take many years, this would only cover 37% 14% of Scotland’s current exports compared to 43% 16% of current exports that go to the EU"
"38. To replace a 5% reduction in Scotland’s EU UK exports with increased trade from the BRICS economies the EU would require a 30% 20% increase in exports to those economies. This within the context that our current levels of EU trade have been achieved after almost 45 years of unfettered market access." "90. Similarly, in relation to the agriculture and forestry sectors, Brexit represents a hugely significant challenge. Food and drink alone accounts for Scotland’s biggest non-energy export, with over two-thirds of exports worth £1.2 billion in the first three quarters of 2017 going to EU countries." "90. Similarly, in relation to the agriculture and forestry sectors, Brexit represents a hugely significant challenge. Food and drink alone accounts for Scotland’s biggest non-energy export, with over two-thirds less than one third of exports worth £1.2 billion in the first three quarters of 2017 going to EU countries." OK, so they ignore exports to rUK when scaling the export figures (and they may have made a "two-thirds" instead of "one-third" typo) ... but assuming Scotland remains in the UK with unfettered market access this approach could be defended, albeit I would suggest it's presented in an intentionally misleading way. Anybody familiar with the indyref debate must surely be raising their eyebrows at this point. 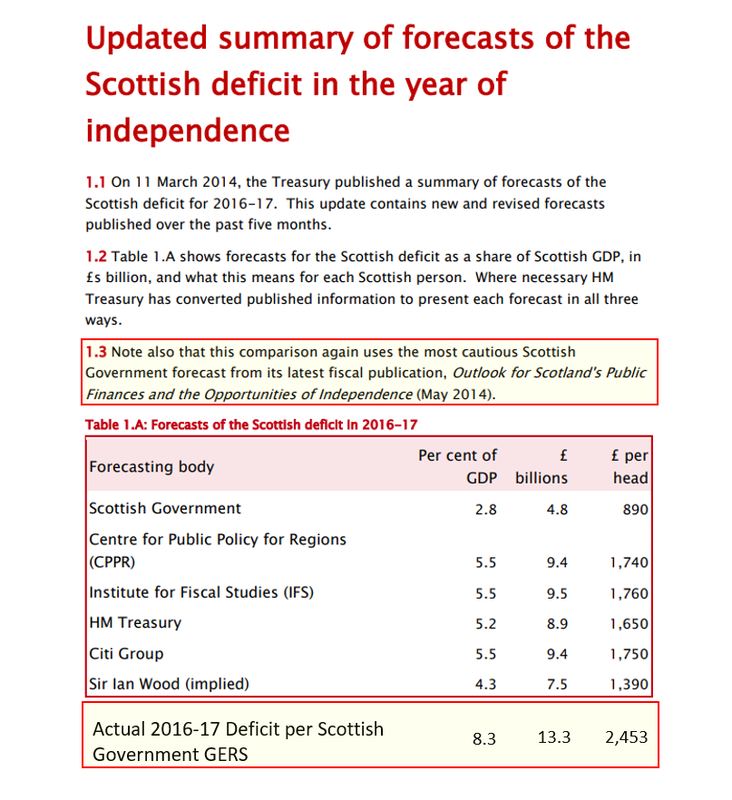 Notice how the Scot Gov forecasts are at the most pessimistic end of the spectrum - "Project Fear" anyone? "But the First Minister dismissed the OBR’s figures as “stuff and nonsense”. A spokesman for the First Minister said: “Danny Alexander must ­apologise for the Treasury’s dodgy dossier on the finances of an ­independent Scotland"
When HM Treasury analysis suggested the one-off costs of setting up the institutions for an independent Scotland would be £1.5 - 2.7bn, Salmond called it a "highly misleading briefing". He suggested the true figure would be nearer £0.2bn, a figure which was obviously fantastical at the time. Later that same year the Centre for Economics and Business Research (CEBR) published a report which concluded: "The set up costs for an independent Scotland would run to nearly £2.5bn"
"on the basis of any reasonable division of existing assets and liabilities, Scotland would begin its independence with a substantial debt burden and less scope for risk-sharing. We estimate that Scotland would need to run primary surpluses of 3.1% annually order to achieve a Maastricht defined debt to GDP ratio of 60% after 10 years of independence. This would be more restrictive than the fiscal tightening over the last four years." "The FAI have also presented the impact on jobs, suggesting Brexit could cost up to 80,000 jobs." That's the same Fraser of Allander Institute who have suggested that more than four times as many jobs are supported by rUK exports as by rEU exports. It will be interesting to see how the SNP respond to HM Treasury and other respected institutions' analyses and forecasts if their fabled indyref2 ever occurs. The real problem is that people wanting us to stay in the UK simply can't trust anything the SNP put out. The SNP are all about Independence no matter what it costs and if they can damage the UK to obtain that objective they will. Having said that many SNP supporters also want us out of the EU and Independence inside the EU is not Independence. I'm very much in favour of a so called hard brexit. Let's just get out and deal on WTO terms. I'm quite certain that if we do that then eventually the EU will want to make a deal with us. "Membership of the European Single Market must be the foundation of our future relationship with the EU if continued EU membership is not presently possible. That can best be secured through UK membership of the European Economic Area Agreement alongside Norway, Iceland and Liechtenstein." "The Scottish Government therefore does not consider that EEA membership is a desirable option from a democratic perspective – Scotland‟s citizens would lose all ability to influence the laws and regulations to which they would be subject." "excluded from the range of important and favourable bilateral trade agreements the EU has signed over the years, and the potential future agreements that it is currently negotiating with some of the world‟s major economies – including Japan and the USA." "Although EEA countries technically enjoy free access to the EU internal market, this privilege is qualified insofar as these countries are obliged to establish complex procedures to ensure that goods and services originating in third countries do not benefit from the EEA provisions. As a result Norway is subject to the EU‟s Rules of Origin requirements. These rules of origin relate to the „Economic Nationality‟ of goods and services and have to be observed by Norway comply with its EEA obligations. This can create significant and costly complications regarding products that draw on wide international supply chains as part of their development, as only a certain proportion of input components can be imported (with each input potentially having a different allowance depending on the EU‟s preferential arrangements with non-EU countries). The Rules of Origin requirements can add an extra layer of complexity, which can raise compliance and administrative costs to firms." "not least because the Scottish Government would lose all influence over the laws and regulations to which foreign investors would be bound. In that scenario it would make more sense for foreign investors to locate in a country that exerted real influence over these laws and regulations." In short, Nicola Sturgeon is arguing for a bad, damaging outcome - which can be proven by simply quoting what she used to say about that outcome. Did this report say that of the £1.2Bn of Scottish exports £875 milion is whisky. And that whisky ( like all other spirits ) is not subject to EU import tarifs so will not be affected by Brexit? Did this report say that £205 million comes from seafood which of course will increase due to us exiting the CFP? Sturgeon's report makes it case by looking at projections for Scotland's GDP. As if that wasn't funny enough, click through and find out who those "economic experts" are! This is all very interesting reading but the UK isn't just a single market. It's an (unsustainable) incorporating political union with Brexit. The rules of origin requirements would actually be neutral for Scotland - it would protect Scotland from rUK firms name-plating in Scotland only and eliminate many issues about goods transshipped via rUK into the rEEA.